Let me give you a chance to take in all the colors of the rainbow. Yes, I know it‘s a lot to take in. But isn’t life like this sometimes too, and yet we all choose to push forward? Blessings abide all around. It is just a matter of perspective. This rainbow striped dress magically creates sunshine for you and those around you. Try wearing this dress and you will see that smiles appear everywhere! 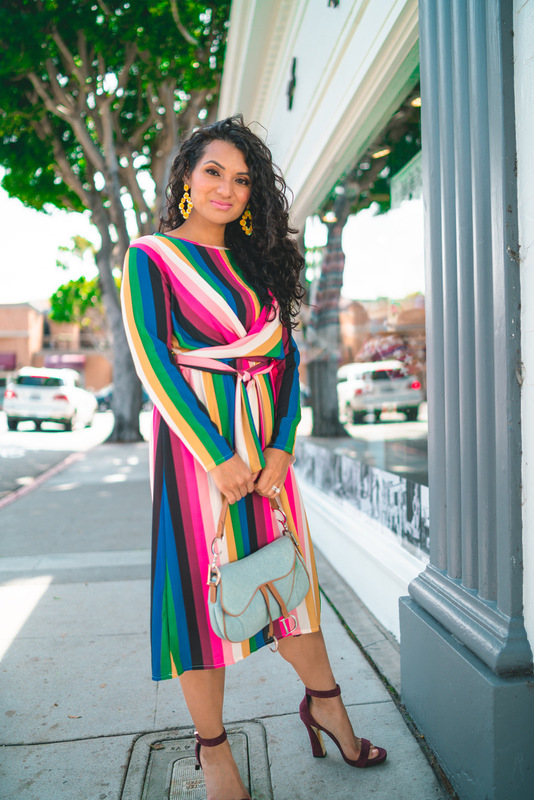 When was the last time you wore a rainbow print? I mean… really think about it. My most vivid memory is when I was a little girl. I was wearing my Rainbow Brite costume for Halloween! 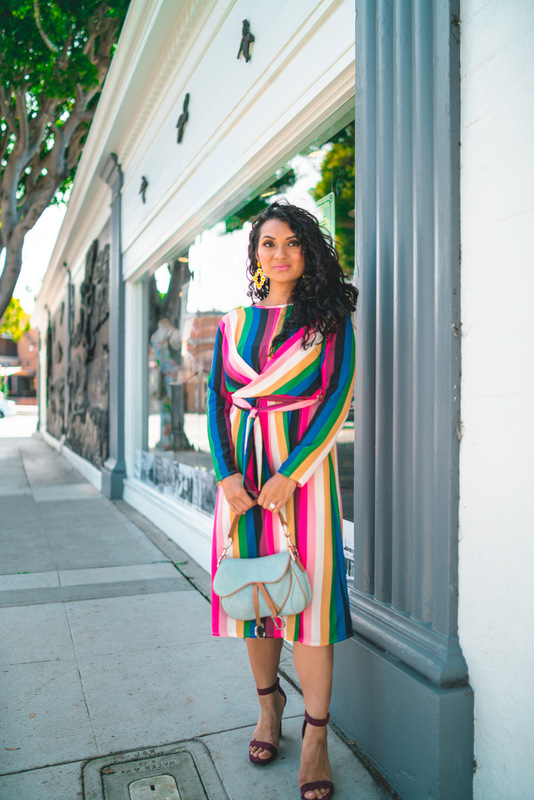 Recently, one of my favorite t-shirts to wear is my comfy cotton rainbow print top that I spotted at Nordstrom Rack, and now this fab dress from SHEIN. Rainbows bring out a child-like giddiness in all of us. It is a sweet reminder that there will be a rainbow after a storm. 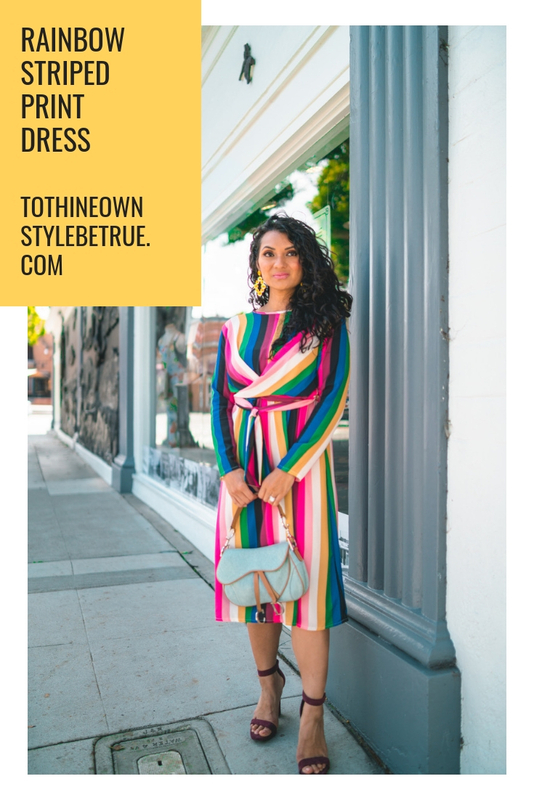 Here on To Thine Own Style Be True, I love to help you make room for “creative space” in your life to try new styles, colors, and patterns. Once in a while, wear something out of the ordinary. You may be surprised that you like it very much! Doing things differently (out of the box) is one of the best ways to connect to your imagination and your artistic side, which is yearning to shine and dance. Try it sometime and post your results here. I would love to hear from you. Keep shining, my friends! As always, thank you so much for visiting my blog. It means so much to have your support and I hope that I inspire you just a bit to try new things, as life is too short to be boring! That dress is so pretty! I love all the colors. I need this in my life. It’s absolutely the cutest. What a beautiful dress. All of the colors are so vibrant. I would be a great look for a garden party of even a graduation. This dress looks amazing on you. I love the colourful pattern. I have been wondering about Shein for awhile now. I wondered if it was a quality brand and if the clothes look as good in reality. 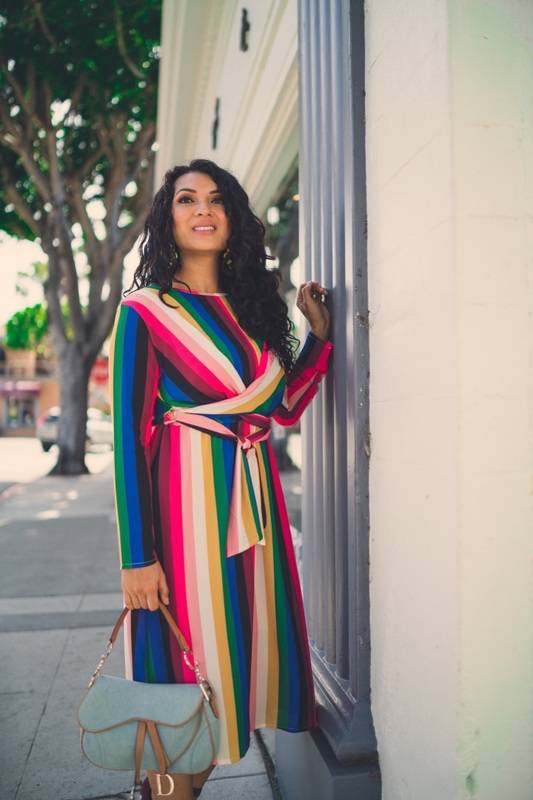 What a fun and vibrant dress! So perfect for all of the upcoming spring and summer parties this year! 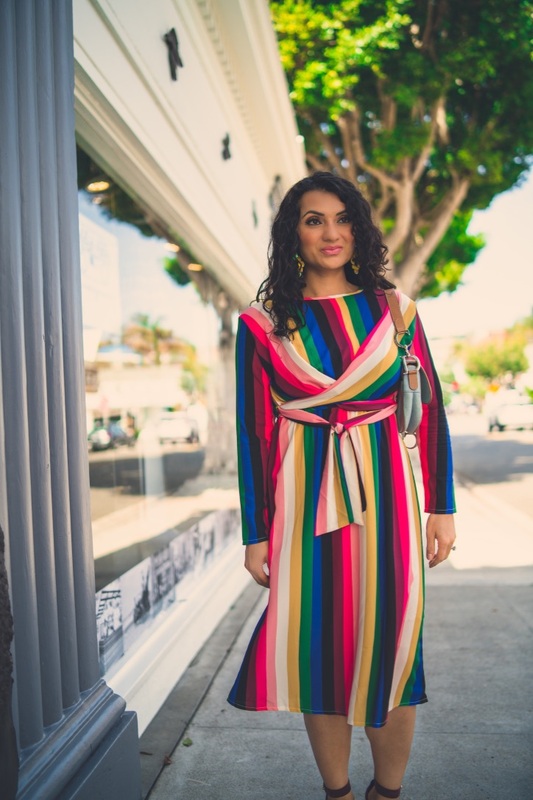 I prefer to dress in bright colors and this rainbow dress sounds perfect for me! I love the dress. The style is so flattering for any body type. I also like the lengthwise stripes. It will make me look slimmer! Wow, what gorgeous colors in that dress! I love where it hits on the leg. 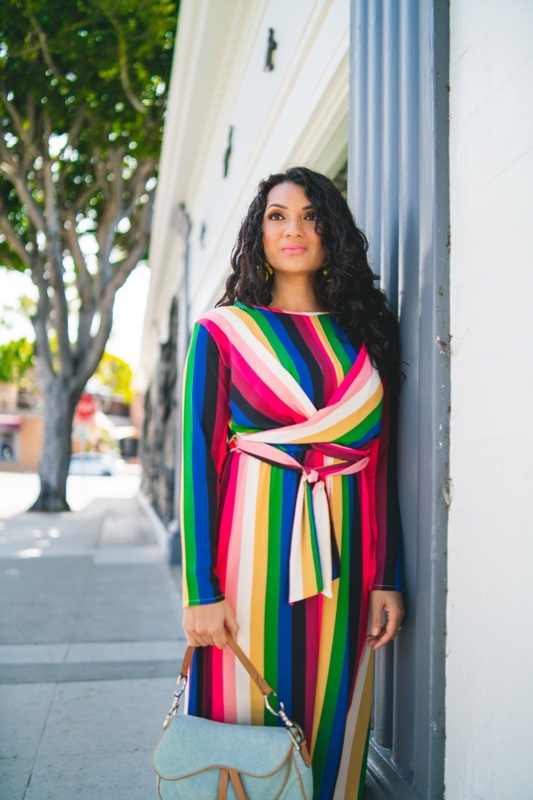 I am in love with all things bright colored, especially dresses. This would be perfect all the way through winter! 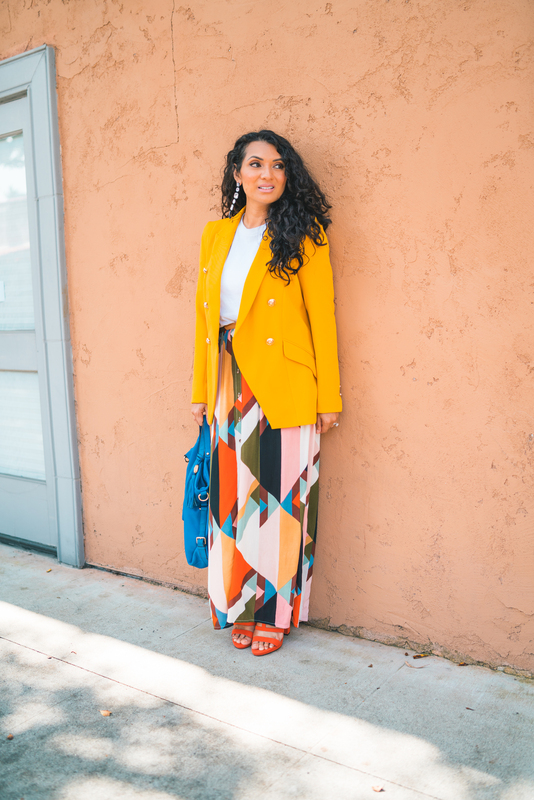 I am obsessed with bright colors. I seriously wish I could pull off this style of dress! Very nice! I love bright coloured clothing. Love this especially as the weather is starting to get warmer. This is such a great dress. Love it. That dress is beautiful. Its the perfect combo of spring and fun! loving the stripes to! 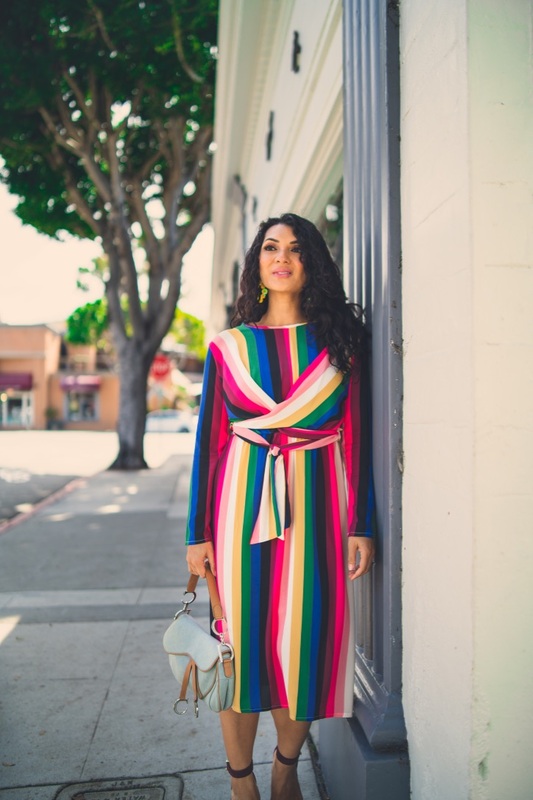 what a vibrant dress! You and I have the same style lovely! 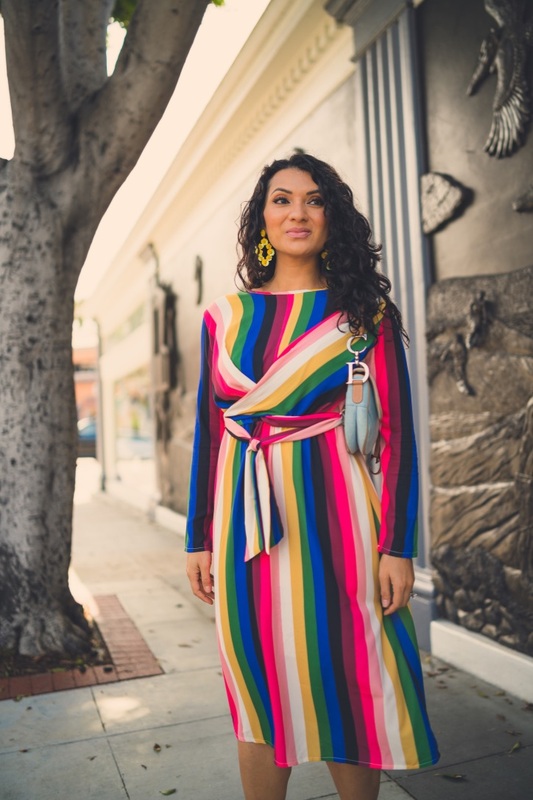 you are rocking that rainbow striped dress dear! happy friday! What a vibrant colored dress. It’s perfect for the changing season and all the bright spring flowers. I like the fit too.